At the end of the Way of St James pilgrims reach the Cathedral in Santiago de Compostela. This pilgrimage has been made since the 9th century. I have no personal experience of the city or the route, though several of my friends have talked about walking it and a few have succeeded. None of them mentioned it but I've read that every bakery and restaurant in the city has this special cake displayed proudly in their windows. I found this recipe in Claudia Roden's fantastic book The Food of Spain. Some recipes call for a pastry tart base but I liked the idea of the filling standing alone. 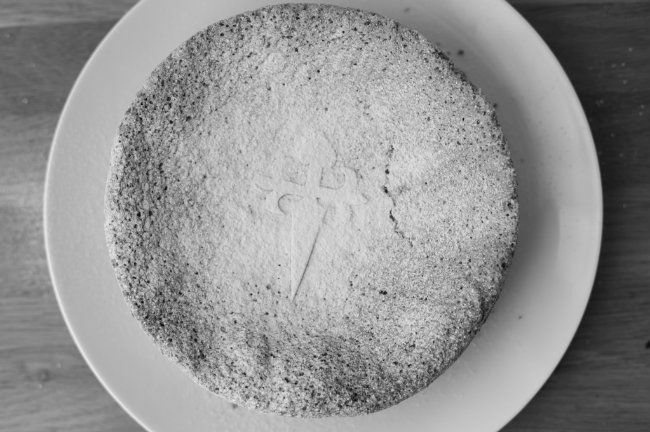 Claudia believes this cake evolved from a Passover cake brought to Galicia by Jews fleeing Andalucia in the 12th and 13th centuries. Even though (and partly because) I'm an atheist, I find religions and their history fascinating. 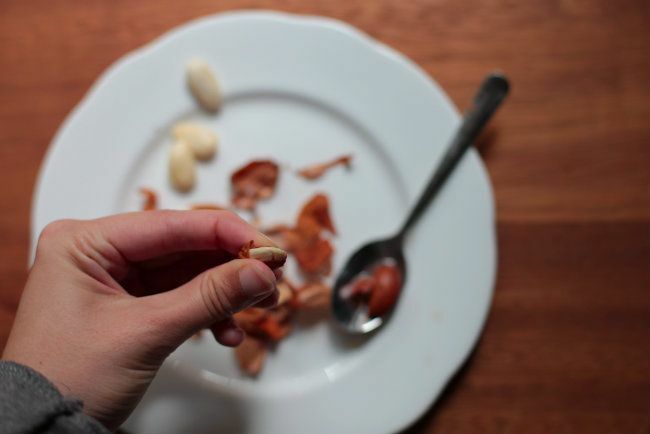 This recipe calls for whole blanched almonds, which you then grind yourself. It's worth the extra step in a cake like this as there are so few ingredients - just almonds, eggs, sugar and citrus zest. If you have whole almonds with their skins on, you can easily blanche them. It's a little fiddly but I rather enjoy it. All you do is place your almonds into a bowl or mug, cover them with boiling water and leave to sit for a few minutes before draining. Then you can just use your fingers to slip the skin off. 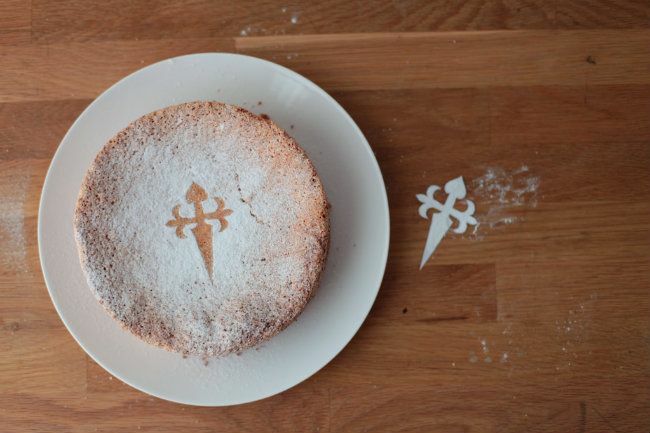 The tarta traditionally has the cross of St James (the apostle's relics are believed to be in the cathedral) stenciled with icing sugar in the middle. I printed off a small version of this template, then cut it out. Place in the middle, dust with sugar, then whip it off. I made a smaller version that fits in a 6 or 7 inch tin, but you can easily double the mixture and use an 11 or 12 inch tin. 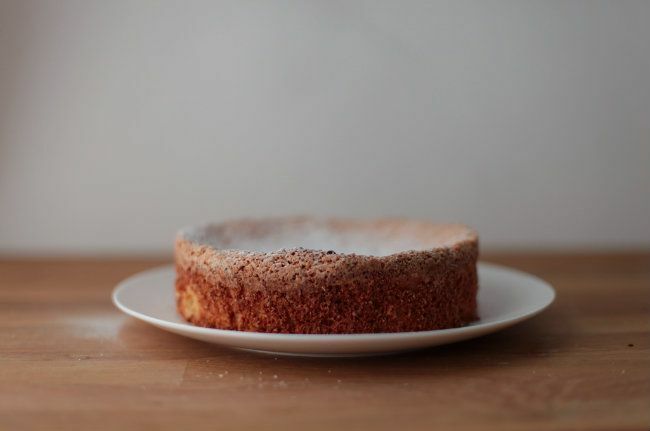 So often damp almond-citrus cakes are very heavy, but this one manages to be feathery light. The edges crisp up almost like a meringue or pavlova. It's simple but perfect. Preheat the oven to 180C/350F. Butter a 7" tin and then dust with flour. Tap out any excess. 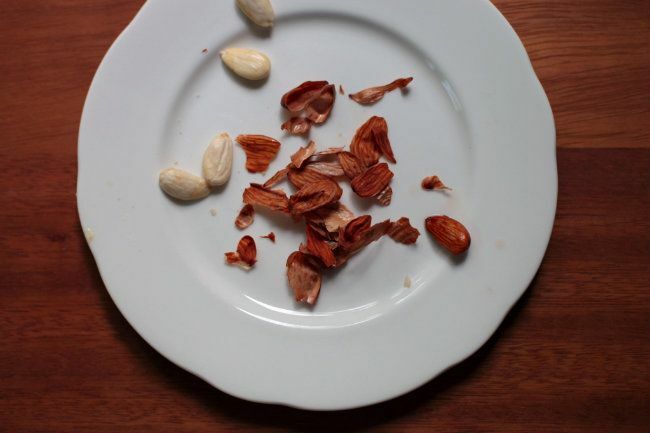 Grind the almonds in a food processor until they're fine - don't overdo it as it will eventually turn into a paste. In a bowl, beat the egg yolks and sugar until they're pale and thick. Stir in the zest. Add the almonds and mix together - it gets pretty stiff. In a clean bowl (wipe down with a bit of lemon if it looks murky), whip the egg whites to stiff peaks. Take a big spoonful of whites and mix into the almond mixture to loosen it. Scrape it all into the egg white bowl and use a big spoon (I use a metal one) to carefully fold them together. Keep folding until the mixture is uniform - you don't want lumps of either mix left, but try to keep most of the volume. Scrape into the tin. Bake for 30-35 minutes until golden and a toothpick comes cleanly from the centre.Leave to cool in the tin. Slide a knife around the edge to loosen the cake then remove to a plate. 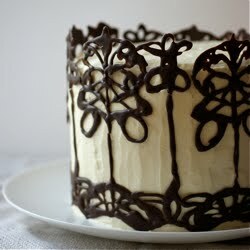 Put the stencil on top of the cake and sieve icing sugar over the top. 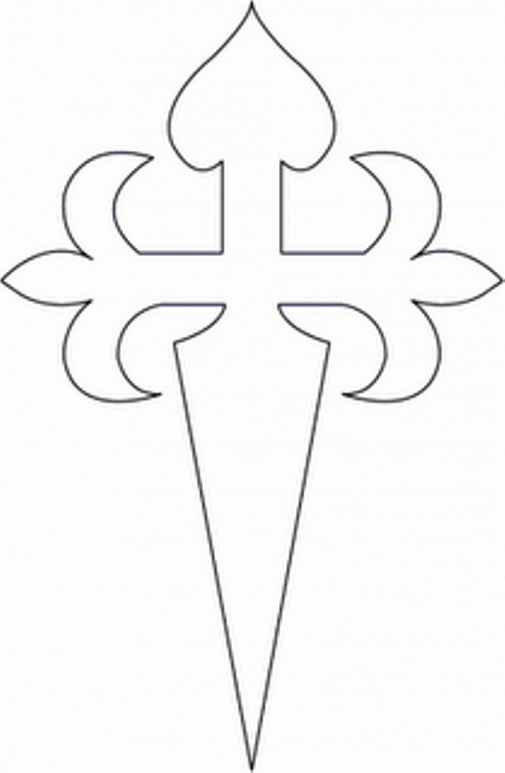 Remove the stencil, then serve. Keeps well in a tin for a few days. This looks lovely! I'll have to put it at the top of my baking list - a break from rich chocolatey things is needed, I think! The origin of this cake in Spain is probably from the Jews,this is one of our traditional cakes in Passover,when flour is forbidden. OOps', sorry I didn't read the post from the begining....:) anyway just want to say I love reading your posts, love your photos and the recipes allways lokes so good..yummy! So lovely in its simplicity. Love the idea of the template - how nifty! Hello from Santiago de Compostela. It´s a perfect description of one of our main desserts. You can accompany it with a cup of coffe or any liquor like the "orujo". I love historical recipes. It's almost like a form of necromancy, a sort of communion with the deceased, with history. Fascinating. I love trying out new (or should probably say very ancient!) recipes like this - cooking and baking can be such an incredible history lesson! This cake looks wonderful, I imagine the almonds make it beautifully light. I love historical recipes, too - reading about origins. laura @ howtocookgoodfood - It's incredible, isn't it - so many ways to combine them to make something special. Courtney @educatedderelicts - I think it'd be a lovely break from rich, chocolatey things (though that does sound tempting right now...). חגית - Hehe - good to know that you also think that's where the cake originated! So glad you like reading the posts. M - The template is rather nifty - you could use the same technique on many things. Rent a Guide SCQ! - How interesting, I hadn't thought of what you are meant to drink with the cake. Thanks for the information! Local Milk - Me too - they're absolutely fascinating. As you say, it's like tasting history itself! thelittleloaf - It's definitely my favourite way to learn history (though to be honest, I like history in most formats). The almonds give it a wonderful chew, too - especially if you leave slightly chunky pieces when you grind. vanilla bean blog - So glad you enjoy reading about the origins - it's one of my favourite things to write about. I love your b&w too! Becs @ Lay the table - How exciting, I wonder where you saw it. 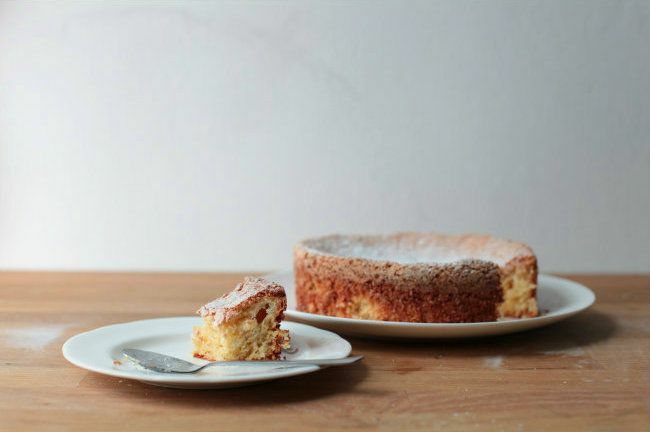 It's a fabulous recipe - quite different to other almond cakes I've tried. When I was in college I did a study-abroad year in Spain and went to Santiago de Compostela--the massive incense orb is something to see. I love the idea of this cake for its associations, but also because it sounds absolutely delicious! The 800-kilometre walk across the North of Spain to Santiago takes 20 to 30 days. 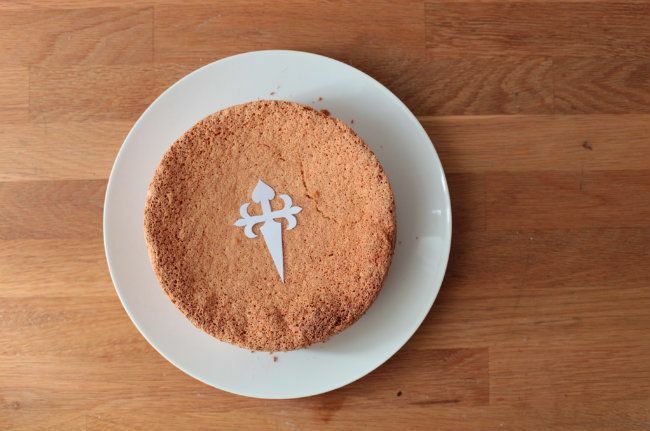 The Tarta de Santiago is never offered until the very end of the journey. It tatses all the more special. Oh no - I'm sorry to hear that. I am quite surprised as I don't remember it as being very sweet. Were your eggs quite small? That might have put the ratio out. I'd be careful about considerably reducing sugar in this cake as it's a key structural ingredient (especially considering there are only three). I walked the Camino this fall as part of my year abroad (I'm at Oxford, too!) and this tarta was one of my favourite things along the way. This version has a bit more citrus flavour than what I remember from Galicia, but it's absolutely delicious either way. Thanks so much for a great recipe! I'm so glad you think it's near the original. Claudia Roden is so excellent that I'm sure she will have tasted it too. Interesting about the lemon - have you tried reducing it a bit? Hope the transition back to Oxford after your year abroad has been smooth!